Here are updated photos of an extremely wide scar at 3 months, 1 year, and the latest results from 9 months. The scar is very wide (5 to 6cm) and tattooed which add another problem for the patient. 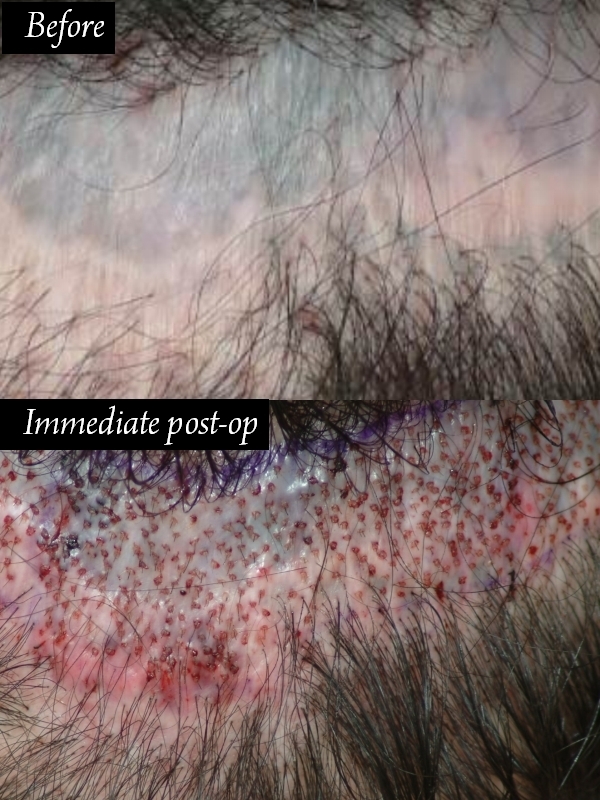 No matter how the scar is treated, removal of the tissue may be more effective in this case if laxity permits. We harvested several regions of the body and transplanted the donor scar with a low density. One year later, we noted that yields appeared good. The areas of higher density produced the best result coverage. It is important to note that our highest density did not exceed 36 per sq. cm. All areas appeared to have a good yield, but coverage was best with about 20 to 30 per sq cm. The transplanted areas grew well, but yield with the leg hair and chest hair was higher, perhaps because we placed these areas with a more consistent and higher density in regard to body hair in scar tissue. The tattoo appeared to fade slightly with grafting. Skin tone took on a more pinkish color with the addition of normal dermal tissue. One can think of this as a delusional effect on scar tissue. One problem is that the body hair is finer and thus produces less coverage. It is proposed that far greater quantity of body hair will be required to produce coverage than scalp hair. It is difficult to determine how much additional body hair might be required, but one might easily estimate that 3 or 4 times as many body hair grafts will be required to produce the same effect as lesser quantity scalp hair grafts. Anagen hairs may provide a better end result for coverage into the scar. The patient is much happier that the scar can be concealed with hardly any effort. The coverage with body hair is thinner and requires much more time to grow. Free virtual consult with Dr. Cole - CLICK HERE! I can see the regrowth but they look very very fine. » I can see the regrowth but they look very very fine. Understood. Body hair has many more limitations that scalp hair. Moving forward, the patient may want to add some beard with a very small percentage of scalp hair. The patient is happy with the growth and we will likely add more density with a combonation of hair. This is a perfectly positive response considering this is different sources of body hair. Remember, it is used as a last resort of donor hair and it’s growth is unpredictable, especially in scar tissue. This result is severly misleading. Anyone who has any sort of common sense knows that this is a misleading result. The after shot is purely a comb over. The body hairs did not provide this coverage whatsoever. Pull the hair up above the scar. It will show the truth. Shame on you for this mis-leading result. » over. The body hairs did not provide this coverage whatsoever. Luckily a lot of us do have common sense. Enough said! It would be mis-leading if our clinic groomed this patient’s “after” photos or touched the images in any way. There’s no shame to be taken in this scenario. I have explained countless times that there are limitations of BHT. 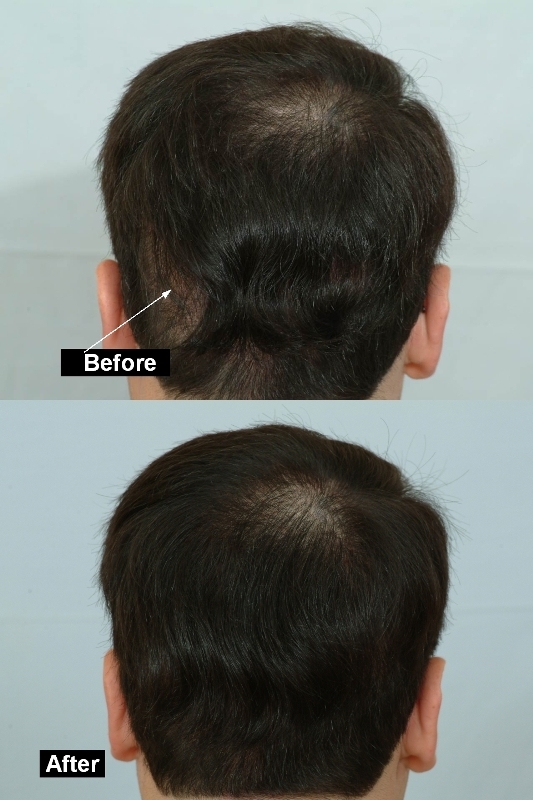 The comparison photos showing the “before” and “after” of the patient’s donor area are untouched and show the exact hair style of the patient as the patient came back to our clinic. 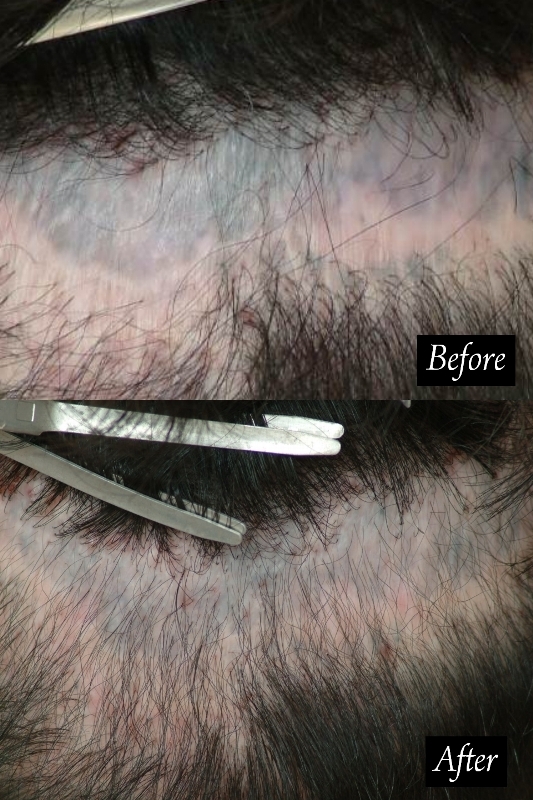 This patient’s hair was not groomed or “touched” in either photo showing the complete donor area and shows the exact hair style of the patient before any hair clipping was done. There’s a difference between posted photos that are manipulated or “touched” and “untouched”. The intent of posting this photo is not to mislead the viewers of this forum but to show the exact “before and after” photo that we always capture when our patients return. How’s the ISHRS conference in Montreal? Hope you are enjoying your new career and it won’t be short lived like your past endeavors. Why is it that your clinic seems to be suspected of exagerations or otherwise misleading posts and pictures on a regular basis? I agree that the hair is CLEARLY combed over the scar. We are not stupid out here! We see the hair transplanted in the scar and can see that it is growing. It is not, however, cosmetic quality hair. There is no way the last picture’s benefit came from the transplant rather than the combover. I agree with Xair. This is an insult. This looks A LOT like a patient by the name of DJ who became disgruntled with Dr. Cole. The reason I say this is because I know that DJ had a “tattoo” treatment in an attempt to hide the scar. Maybe I am wrong?